While Orbert Davis developed his musical training and early career around studio work, for the past 15 years the trumpet player has made a huge impact on the lives of students in Chicago. 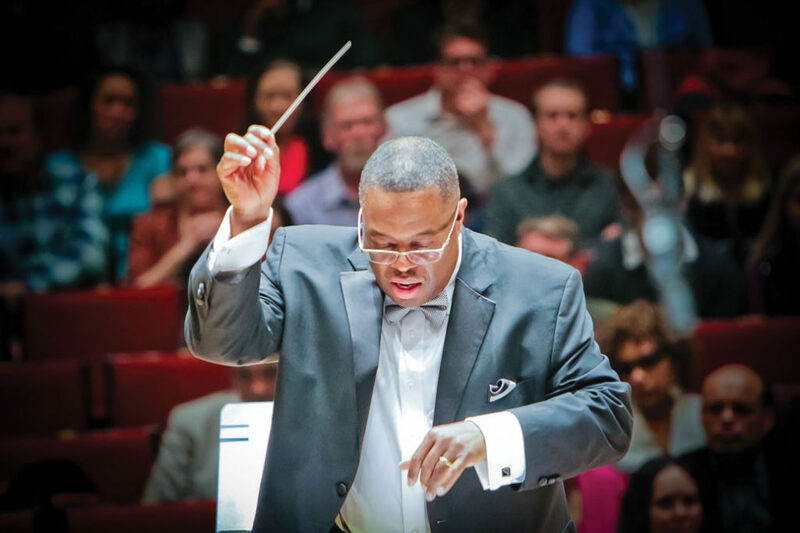 A longtime member of Local 10-208 (Chicago, IL), Davis is artistic director, conductor, and co-founder of Chicago Jazz Philharmonic and co-founder of the CJP Jazz Academy, as well as the school program Discover Music: Discover Life (DMDL). In addition, he keeps on top of the local and national jazz scene through his three-hour weekly radio program, The Real Deal with Orbert Davis. Growing up in a small town one hour south of Chicago, Davis’s introduction to music came through his school band program. He took to the trumpet right away, showing genuine talent and dedication. “I was a serious practicer,” he says. Fourth grade teacher Chuck Danish took note and made the commitment to help Davis succeed. “He is one of the most incredible people in the world. When I was in eighth grade, he heard me play and vowed to my parents that he would take me to trumpet lessons when I entered high school. Every weekend throughout high school he drove me 70 miles. The only payback he wanted was that I would help others; that definitely planted a seed in me,” says Davis. In tribute to Danish, he later created the Charles Danish Scholarship to provide a year of mentoring and private lessons to promising young students. Davis took private lessons with Mark McDunn who taught at DePaul University. “Mark was a studio trombonist with the CBS Orchestra in Chicago and he sort of carved a path for me to be a studio musician,” says Davis. When Davis got into high school he discovered jazz and met his best friend and later business partner, Mark Ingram. “We were both obsessed with music and performing; we fell into jazz because of the challenge of it,” says Davis. Studio work led to opportunities to play on stage with many accomplished peers. “There was a jazz club around the corner from DePaul called The Wise Fools. On Monday night all the really busy musicians formed a big band and played there. I got to play with musicians like Bobby Lewis and Art Hoyle. That really set the pace for me to learn what it meant to be a musician. I worked extremely hard,” says Davis. Davis now sits on the board of Ingenuity, Inc., which is focused on getting arts instruction back into Chicago classrooms. “Funding is getting better and more students have access to the arts. My goal is that, one day, every student will not just have access to arts, but music will be part of the fabric of every subject. Music provides a soundtrack for any moment in time—an aural snapshot. Today’s students are interactive—hearing and seeing things at a pace far different from when we were children. We can reach them through music,” he explains. Undeterred, Davis set to work raising funds, in particular securing funding from the Boeing Company, which had just relocated to the city. From the beginning, they knew the “third stream” Chicago Jazz Philharmonic (CJP) would continue beyond that first festival, given the aesthetic of what happens when you combine jazz and classical, says Davis. CJP now comprises about 60 professional musicians and Davis says it goes beyond the third stream musical designation. “Our musicians are versed in both genres. It’s amazing how they respond. It’s about listening, adapting, interpreting, and most importantly creating,” he says. Local 10-208 (Chicago, IL) member Orbert Davis conducting a Chicago Jazz Philharmonic performance at the Auditorium Theatre in 2016. The performance featured 35 music students from Havana, Cuba. For CJP’s first 10 years, Davis conducted the group, was a pro bono guest soloist, and composed all of the music, but there’s now a team of arrangers and composers to help. Co-founder Ingram, also a member of Local 10-208, is the producing director. The longtime executive director is Birdie Soti. Davis stresses CJP would not be successful without his team. Like all of Davis and Ingram’s projects, CJP’s impact goes deep into the community. 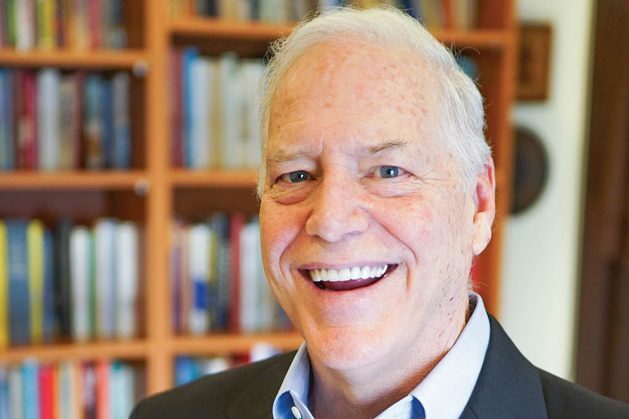 “Every time we are on stage or in the classroom, change happens—a change in the creative process, a change in the dialog, a change in lives, and a change in communities,” he says. One outstanding example was last year’s Chicago Immigrant Stories concert series that brought together some of Chicago’s disparate ethnic groups. “I’m extremely sensitive to propaganda of fear and marginalizing people and the results of the immigrant ban,” says Davis who has many friends who came to the US seeking better opportunities. “I have a friend whose ancestors escaped the Holocaust and friends whose ancestors, like mine, were stolen from their homes to become slaves.” But it was a Facebook post from harmonica virtuoso and Local 10-208 member Howard Levy about his ancestry that inspired Chicago Immigrant Stories. 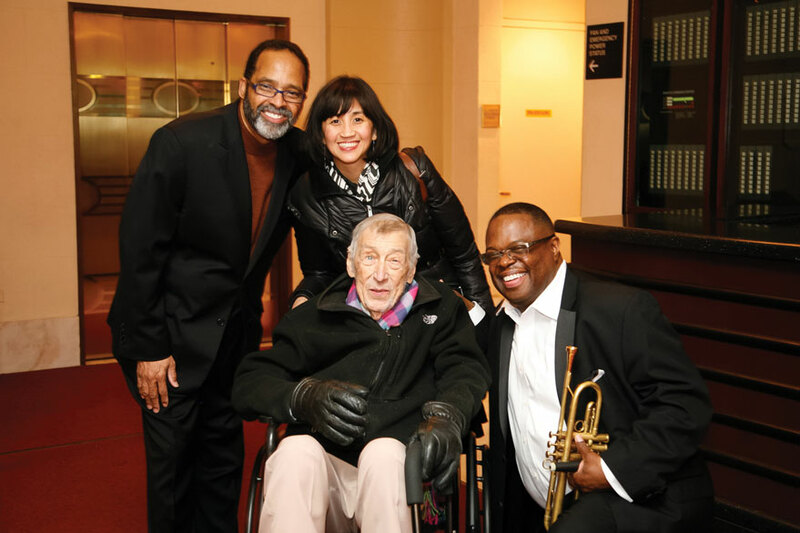 A 2015 Chicago Jazz Philharmonic performance at Symphony Center Chicago celebrated the life and works of Gunther Schuller. (L to R) are: Local 10-208 (Chicago, IL) member, CJP Co-founder, and Producing Director Mark Ingram; Executive Director Birdie Soti; Schuller, and Local 10-208 member, CJP Co-founder, Artistic Director, and Conductor Orbert Davis. Davis has long been interested in understanding the cultural characteristics of music. 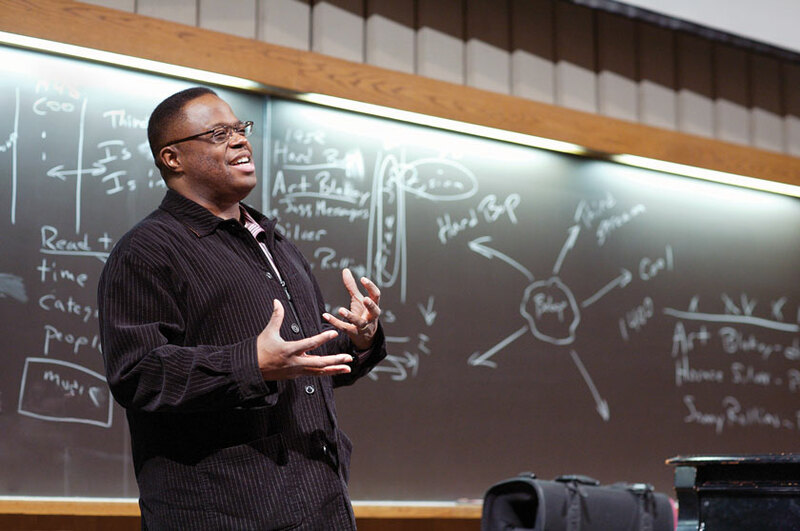 He went back to school to earn a master’s degree in history from Northwestern at age 37. “There were so many gaps in my education in terms of understanding where jazz came from and not understanding at all the evolution of African American music from Africa and why music of North American African ancestry sounds different from Central and South American,” he says. The educational offshoots of CJP, Chicago Jazz Academy and its youth ensembles, serve to inspire the next generation of jazz musicians. In its 11th year, Jazz Academy is a two-week summer camp at Chicago State University for students aged six to 18, plus a Saturday afternoon program. Davis credits the academy’s success partly to its teacher and student retention rate. “Last year, every one of our 12 counselors were former students and we have four or five teachers who are former counselors,” he says. 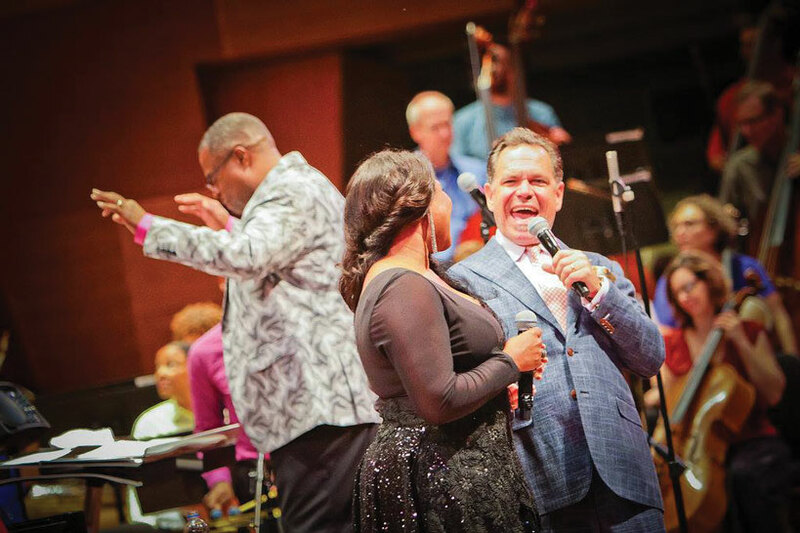 Local 10-208 member Orbert Davis conducts Chicago Jazz Philharmonic in a 2018 Chicago Jazz Festival performance at Millennium Park that featured jazz artists Tammy McCann and Kurt Elling. Today, Davis’s vision goes beyond Chicago’s city limits. “Musicians have to be multi-lingual in terms of music,” he says. 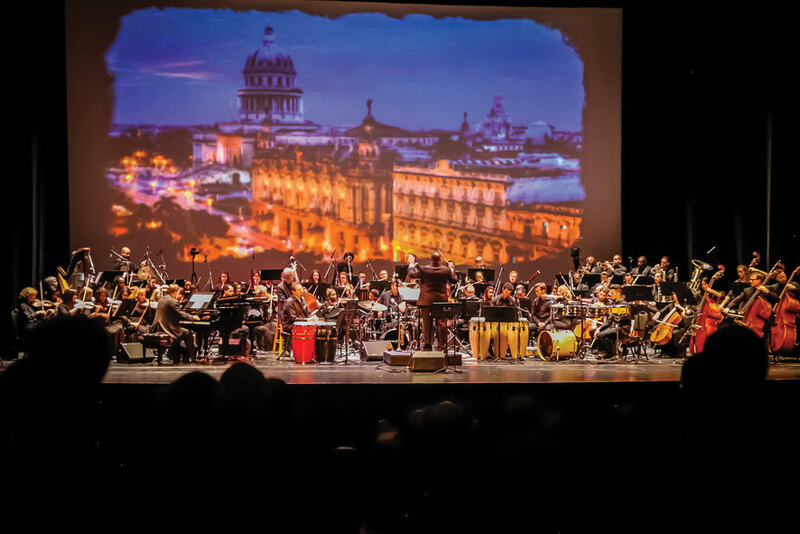 In 2014, he took CJP’s rhythm and jazz sections to Cuba where they put together a 60-piece orchestra with Cuban students at the Universidad de las Artes in Havana. Then, in 2015, 37 Cuban students came to Chicago to perform with CJP.